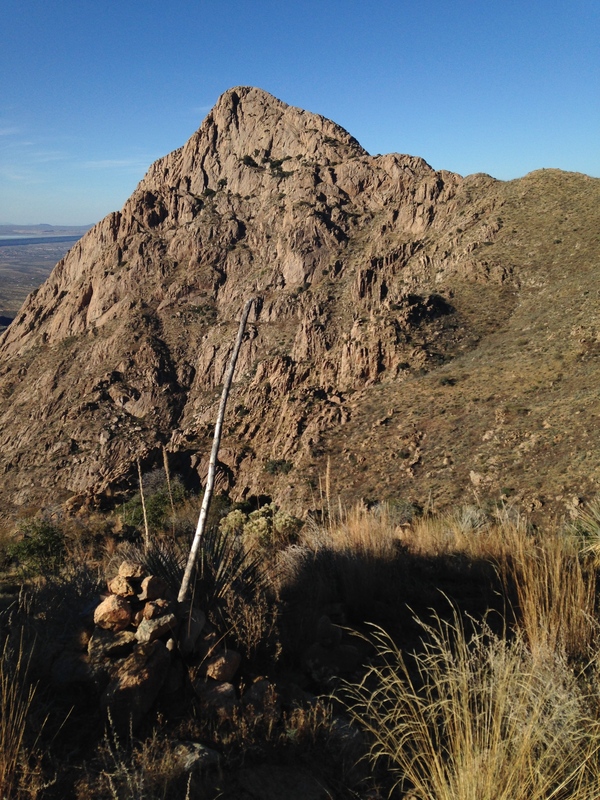 When you look south from Tucson towards the Santa Rita mountains, your eye is drawn to Mt Wrightson, the highest peak around Tucson. You will barely notice Elephant Head, the lowest summit on the very right hand side of the Santa Rita’s. However, when you drive south on Interstate 19 you will certainly notice Elephant Head because of its dramatic cliffs. To get to the top is a relatively short hike (about 6 miles round trip), but it involves some class 2 and class 3 scrambling and some exposure. Fortunately the exposure is on easier terrain and the class 3 is not particularly exposed. When you get to the top you’ll see a plethora of elephants. Bring an elephant to leave, so you increase the size of the herd. Head south on Interstate 19 and get off at Exit 56, Canoa Road. Note that the distances down I-19 are in kilometers rather than miles, so exits are closer than the exit numbers would normally suggest. After exiting, go round the roundabout and under the Interstate. Turn right and drive about 3 miles south on the frontage road. Turn left on Elephant Head Road, then in about 1.5 miles turn right on Mount Hopkins Road, towards the Whipple Observatory. After 5.5 miles turn left on the dirt road that is signed towards Agua Caliente. This is forest road 183 and you’ll see the 183 sign shortly after you turn up the road. Walk about 50 feet or so back down the way you came up then take Forest Trail 930, the obvious trail to the right (there is a sign showing 930 once you start on the trail.) Follow trail 930 for about 0.9 mile as it goes up to a saddle then descends slightly to another, bigger trail. Make a mental note of this junction as you will be coming back this way. Turn right onto the road-like trail and follow this as it curves gently around to the left and towards Elephant Head. Eventually you will leave this big trail and head down a climbers trail into upper Chino Canyon. As you follow the big trail towards Elephant Head, it will eventually turn right and parallel Chino Canyon. The descent trail starts at the point where the main trail changes direction and starts to parallel the canyon. The photo on the left shows the cairn that marks the start of the descent. Descend several hundred feet to the canyon floor then follow the trail up the other side to the ridge. Follow the trail left along the ridge as it rolls up and down towards the rocky mass of Elephant Head. 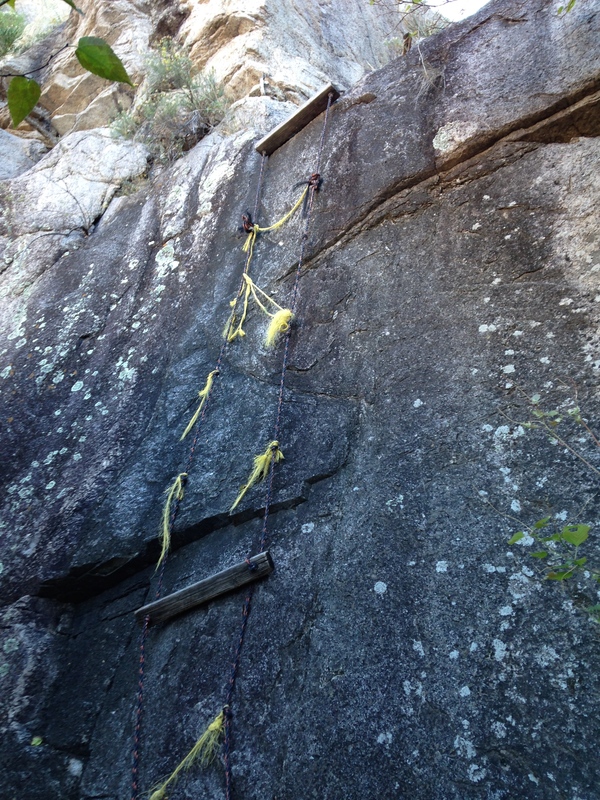 Eventually you will be faced with the rocky ridge and some class 2 and 3 scrambling. There are cairns in places, and well-trodden paths in other places, but at other times you will just pick your own way up. If you ever find anything harder than class 3 scrambling, or anything super-exposed, you have chosen the wrong way. 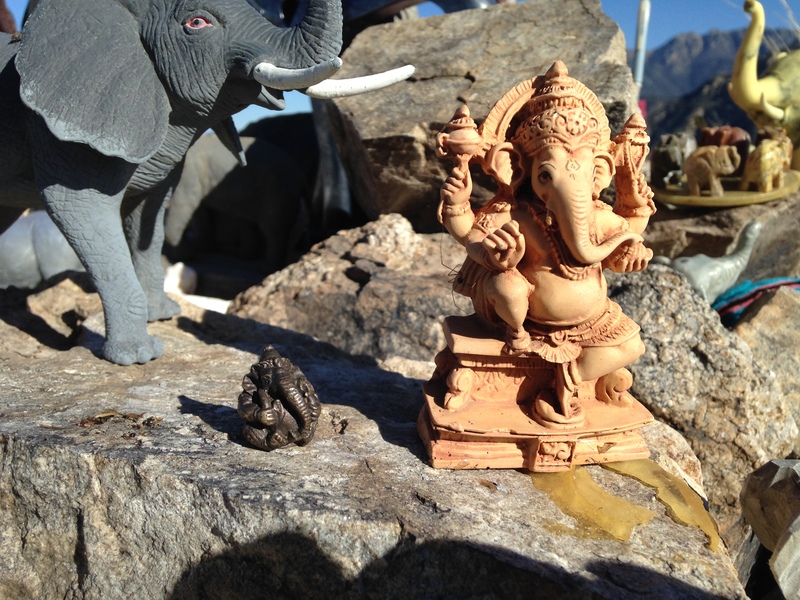 Finally you reach the summit plateau and the elephant sanctuary (or elephant shrine as some people call it.) Enjoy the view, leave behind your own elephant gift, then make your way carefully down the rocky ridge to flatter ground. 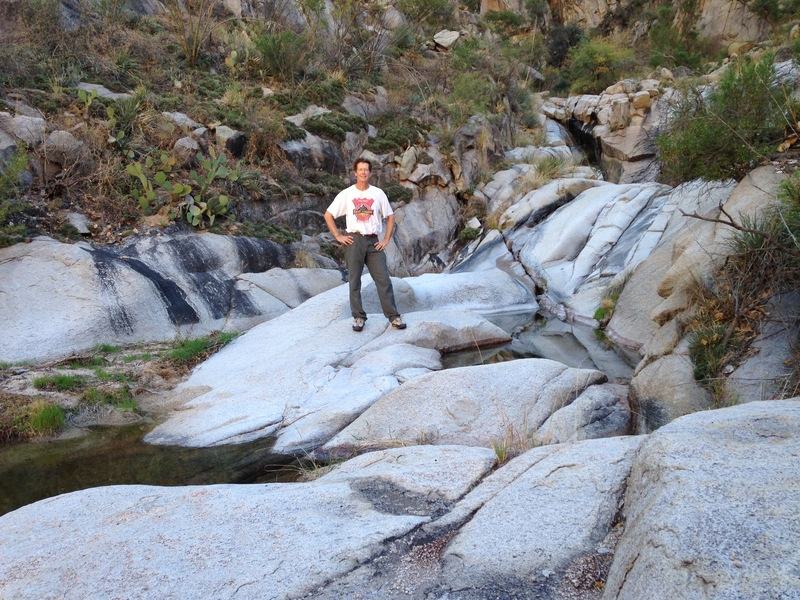 Then retrace the hike, wishing you didn’t have to descend into and climb back out of Chino Canyon. After reading an account of a group that descended Chino Canyon, I decided that it might be fun to climb up Chino Canyon. If you are confident enough to scramble up class 4 and easy class 5, then you don’t need much of a description. After the initial 0.9 miles, when you reach the bigger trail, turn left and head downhill for a bit over a mile and a half. Find your way to the Chino Canyon riverbed and follow this upstream until it you reach the big rocks and the scrambling begins. Don’t use this ladder! I climbed a crack to the right. Not my photo. 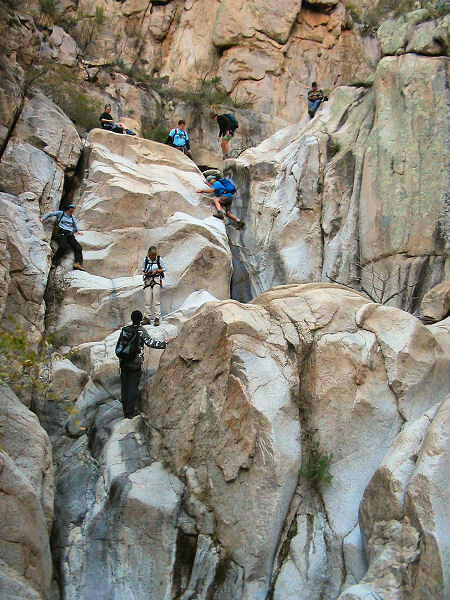 Shows people descending Chino Canyon. Here’s the page that describes people descending Chino Canyon. 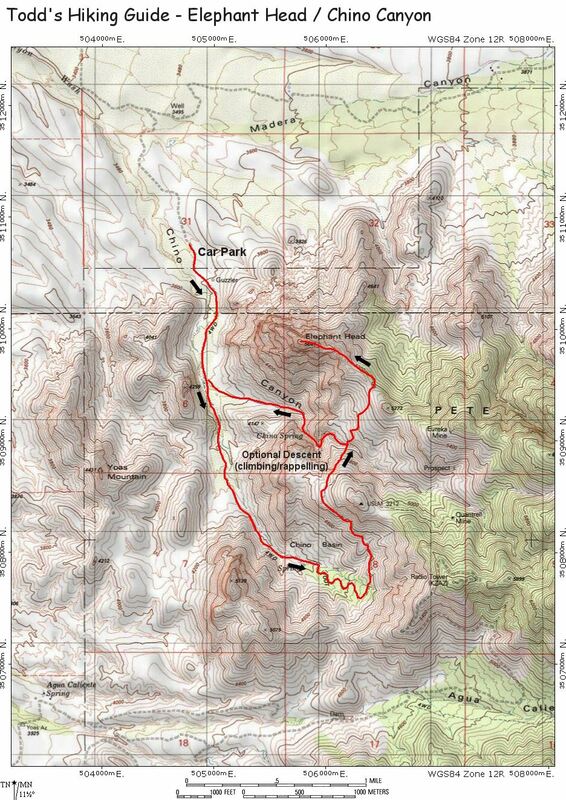 Here’s a page with a map, and another map that shows the route through Chino Canyon. A page with some good photos of the hike. 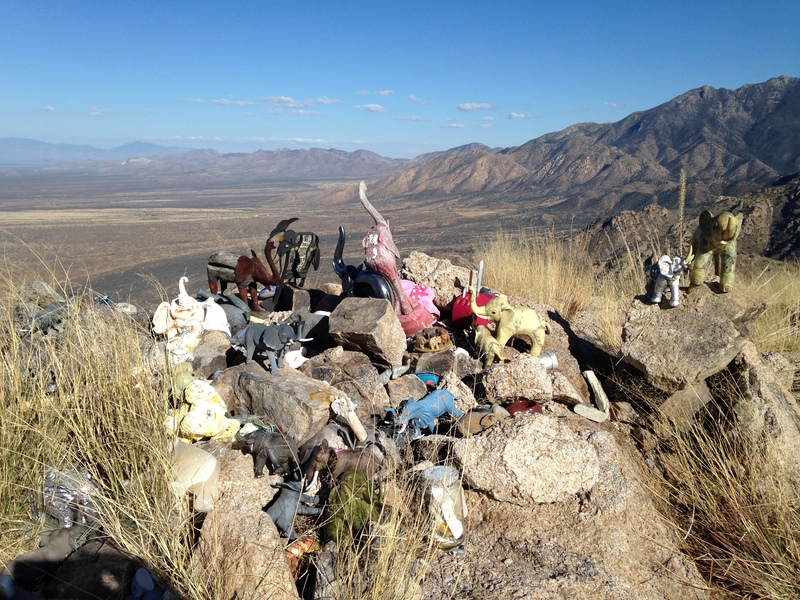 If you are down in this area you might consider cycling up Mt Hopkins.